Shortie but Goodie: Roasted Fennel – Yours Julie – Mostly travel, also food. Anyway! Hear me out! I encourage you to try this once, and if you STILL hate it, you have my permission to type up some angry comments. Mix the oil with the powdered stock. Wash and cut the potatoes into wedges, toss with the mixture from above. Spread potatoes on a baking tray lined with a baking sheet, try to have the flat side facing down, this way the fries will get extra crispy. Bake in the oven at around 180°C for about 10-15 minutes. 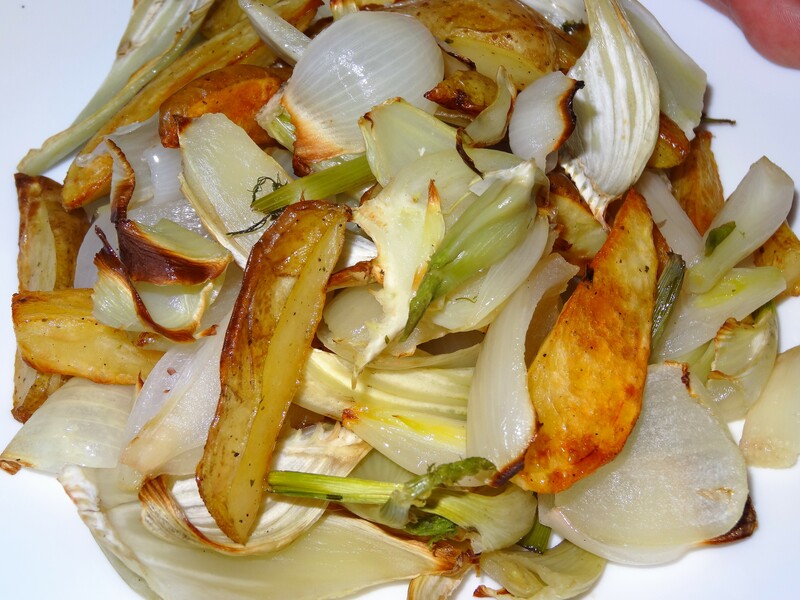 In the meantime, cut the fennel into chunks of roughly the same size as the potatoes. Peel and quarter the red onions and separate the individual layers. After the potatoes have softened a bit (check with a fork), take the tray out of the oven, toss the fennel and onions on top of the potatoes and put everything back for another 10 minutes or so (Occasionally check to see if anything burns) until the fennel is soft. Toss everything, sprinkle with pepper, and serve. Add a dip of your choice or a fresh salad. You can also roast a few pieces of pumpkin along with the rest, just add them to the potatoes. Since pumpkins are not in season here right now, I will simply pretend they don’t exist, because that is the only way I can deal with this lack in my life. Fennel and onion have enough flavor to be good just like that and the seasoned (and ideally crispy) potatoes should provide enough saltiness for the rest of the veggies, but you can always add more salt. And if in doubt, add crushed garlic to the oil mixture. Red onions do make a difference. I have converted at least one outspoken fennel-hater with this recipe, who now loves it. Truth. Also: This recipe is vegan.